We have a great accessory for your medieval home decor, our dungeon keys. 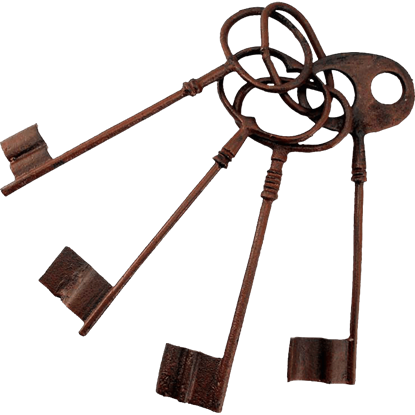 Dungeon keys are great for using as stage props and productions or just for carrying around at the Renaissance fair. Our selection of dungeon keys includes castle keys, fortress keys, and other rustic medieval keys. Some keys have an aged finish to give them an authentic look, and others have a polished brass finish to make them look newer. Each set of keys has a larger ring holding four or more dungeon keys on it. 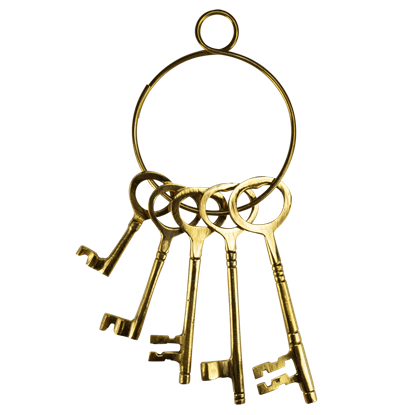 Whether your needing a stage prop or an extra detail for your medieval outfit, these brass castle keys will help. A good set of keys can have so many uses, as well as unlocking new doors, both metaphorically and literally! 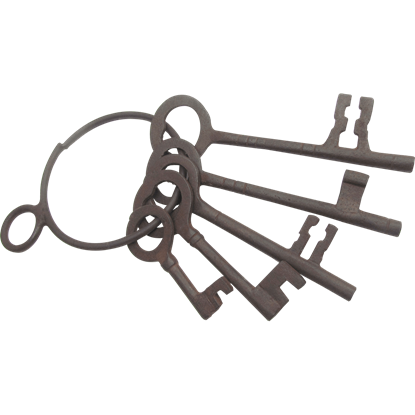 These Antiqued Brass Jailor Keys accurately recreate five traditional medieval keys that are perfect for a number of uses. 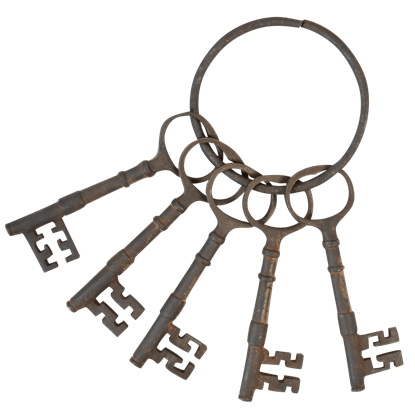 A handful of authentic keys are just what any prison keeper or jailer needs to make the image complete, and the Antiqued Jailer Keys are just that. With their worn, cast iron finish, the keys have a historical look and appeal. Looking as though they belong attached a Roman legionnaires belt, these Brass Prison Keys are a classic example of historical keys that would have been used to lock virtually anything, ranging from doors to chests and boxes. While jailors in the old west might have been tempted to lock up an outlaw and throw away the key, seldom did it happen. 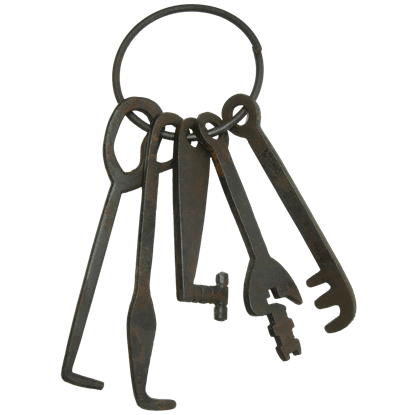 These Wild West Jailor Keys are the sort that a sheriff might have for locking and unlocking the cells in his jail. 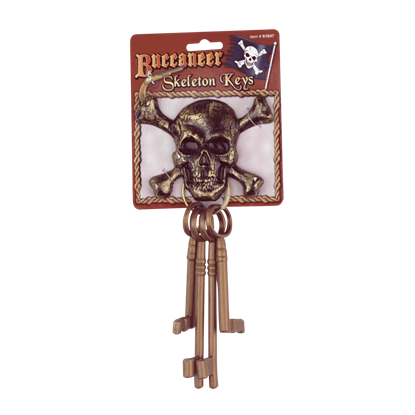 These Buccaneer Skeleton Keys are just the thing for any pirate to have, especially if the keys let them into all sorts of treasure chests filled with plunder. With their skull and crossbones hanger, they are also quite pirate-y too. 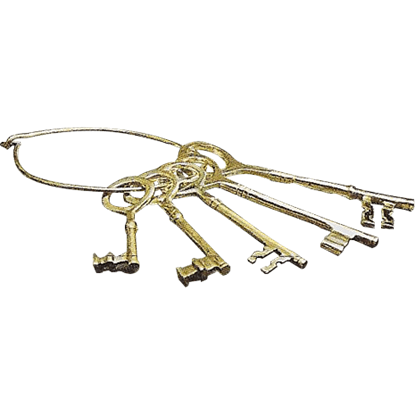 The Giant Fortress Keys is a set of 4 giant keys on a ring. Each key is 10 inches long and very authentic looking. 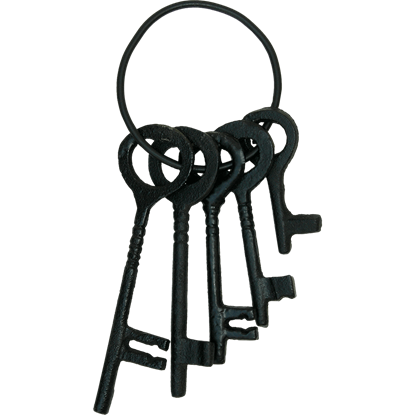 Whether you need a stage prop or to give your dungeon an added look these giant fortress keys will help. If you wanted something secure in the old days you kept it under lock and key. 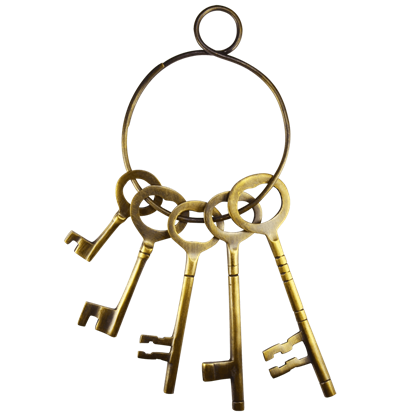 This set of Heavy Mission Keys echoes the look of larger more secure locks by virtue of the considerable size of each and every key kept on its ring! The craftiest, most dangerous outlaws always have loyal gangs and elaborate escape plans for whenever they are brought before the law. 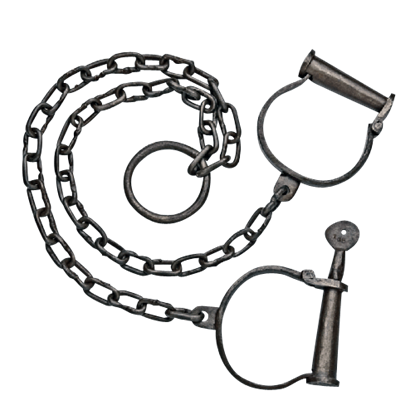 Make sure that your prisoners stay put by equipping yourself with the Iron Jailer Key Set. The practice of cuffing a prisoners hands is not a new one. It has been around since the Dark Ages. These Old West Antique Handcuffs are quite effective when it comes to keeping your hands locked securely together. Many think of the ball and chain as a medieval piece, but that is not true. It had it uses, even in the Wild West. 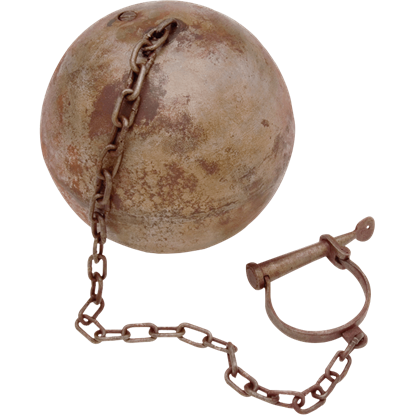 This Old West Ball and Chain has a realistic look and is perfect for locking up criminals for their life of misdeeds. They may not have been as sleek as handcuffs are today, but shackles did get the job done back in the days of the Wild West! 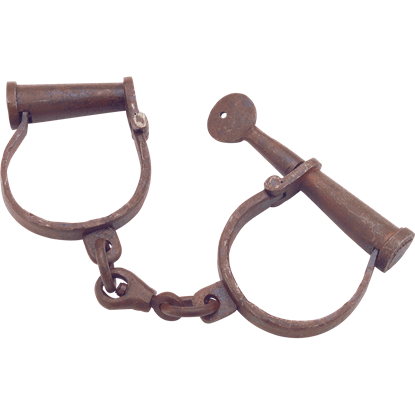 These Old West Leg Cuffs look to be rather effective when it comes to restraining a prisoner or a convict. When you are faced with an unusual lock, bring forth this equally distinct set of iron keys. Inspired by ancient designs, this Pirate Push Keys Set is fantastic for display or costume accessory. Five diverse keys hang from a sturdy ring. These bottles are an awesome addition to my plague doctor outfit. The green colour gives just the right eerie ambiance for the character, and they feel very high quality. Cheers!